President Murray relishes his exploitation of the poor. Jenna Harrison, a Marist student and self-proclaimed social activist, began her Occupy Dennis Murray campaign yesterday in protest to Murray’s high salary. Harrison realized that her anger over Murray’s salary was a direct indication of her impressive social awareness. Not content to let her moral superiority go to waste, she promptly purchased a tent and some picket signs with her parent’s credit card and prepared to change the world. 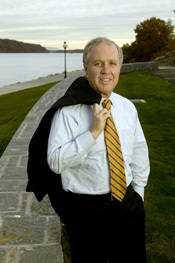 According to Harrison, President Murray’s salary is also responsible for Marist’s lack of a track, corruption in Wall Street, and the $17 trillion debt of the United States government. When asked about the movement, Murray seemed more curious than concerned, and remains unsure of how exactly Harrison will go about occupying a human being. December 17, 2013 in On-Campus.